Earlier this year, Mailjet launched MJML. A framework that replaces traditional coding with a new and simpler markup language and thus makes responsive email coding easier. The idea behind MJML is simple: it is a semantic and high-level markup language made of components and abstracting the complexity of responsive email HTML. MJML will generate responsive email HTML for the users, including conditional comments for Outlook and nested tables, mixing the mobile-first and hybrid or “spongy” coding approaches. MJML users can focus on the structure and styling of their email instead of spending hours to try and make it work in all the major email clients. Here’s what the code would look like to create a responsive 2-column email layout. Please note that thanks to the hybrid coding approach we use, the 2 columns would vertically stack on mobile. Mailjet decided to make MJML open source so that anyone from the community could benefit from it. According to Mailjet, MJML is and will remain open-source, under the MIT License, meaning anyone can use it as they wish and even build their own email builder on top of it. Because it is open source, anyone can also help make it better by contributing to it, adding improvements, reporting issues or implementing new features. MJML was nurtured for months at Mailjet, used initially in their own drag-and-drop email design tool called Passport. Before launch it had already been used for a year as the engine that would generate the responsive HTML from the blocks users dragged and dropped. A full library of components is available, from low-level components such as mj-text which will only render text, to mj-navbar which will generate a responsive navbar, including an option to create a hamburger menu. To discover the full library of components, more information is found in the documentation. As well as a gallery of templates. The open source framework received a warm welcome from the #emailgeeks and developer communities, including experts such as Kevin Mandeville from Litmus. The project also received more than a 1,000 upvotes on Product Hunt and 3,500 stars on Github in a few months. MJML now has its own community, being used by thousands of users each month (2.5k monthly unique visitors on the MJML web editor and 5k monthly downloads on NPM). This community is active on Twitter and Slack where members share feedback and tips. Beyond email coding, Mailjet wants to help people who want to integrate it in their workflow. Members from the community such as Liminspace and Inventid built wrappers (django-mjml) and libraries (Maily) around MJML. With 26 releases in the last 6 months, there is a new release almost each week and the framework received pull-requests from 27 different contributors. The Mailjet team tells us that it is dedicated to keep improving MJML and even try to make it a new standard for email coding thanks to the help of the community. To make MJML easier to use, Mailjet is planning to integrate it in the Mailjet API. Users will be able to send emails formatted in MJML directly through the API, without having to generate the responsive HTML on their end. Next to MJML, Mailjet launched various new additions to their platform. In a new version of the Mailjet email builder Passport, developers and marketers can collaborate while creating and editing marketing and transactional emails. Marketers have everything at hand to create their emails in drag and drop, developers can use the tools to include transaction details and integrate them in their website or mobile app back office. Also, email automation features were first released in June 2016 with a welcome series. 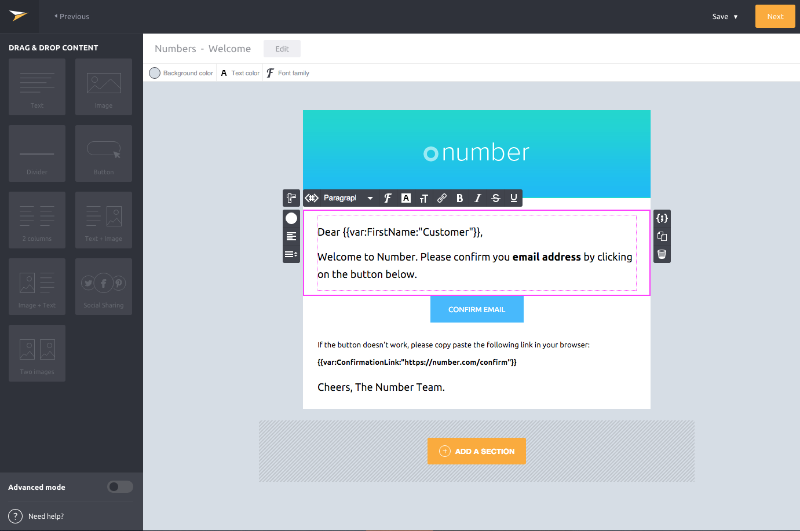 The Mailjet team lets us know that more pre-created (out of the box) automation scenarios, like Contact Property Update, Birthday or Reactivation will be added in the coming months. Thanks to Nicolas Garnier from Mailjet for providing such a detailed explaination of the MJML features.